The Grand Canyon state contains all the varied puzzle pieces of the contemporary Southwest, taking in the spires of Monument Valley and the upscale nightlife of Scottsdale. A big tent state of libertarian cowboys and shop­aholic suburbanites, cacti canyons and desert golf courses, Arizona still embraces an Old West flavor. Staking out opposite ends of the state, it claims the cool college towns of Tucson and Flagstaff. Victorian mining towns like Bisbee and Jerome exude rough-cut character, and New Agers in Sedona revel in its unseen energy. Travelers pass back and forth through the busy border hub of Nogales, and Wild West tourists flock to the shoot ’em up town of Tombstone. But in the end, the Grand Canyon is always Arizona’s showy jewel. Arizona is bordered by Utah to the north. In the south, Arizona shares an international border with Mexico. On the east is New Mexico and on the west is Nevada and California. A very aural reminder of Flagstaff’s history, approximately 100 freight trains barrel through this fine mountain city each day, blowing their horns with spirited abandon. A funky, vibrant town filled with students attending Northern Arizona University (NAU), Flagstaff boasts cool mountain air, ponderosa pines and even a mountain to ski, and is the favored summer retreat for the folks in Phoenix. Microbreweries, interesting hotels and hip restaurants are housed in historic brick buildings a hop, skip and jump from historic Route 66. There are plenty of outdoorsy adventures, and hiking and biking trails are abundant. Less than a two-hour drive from the Grand Canyon, Flagstaff makes a great regional base. 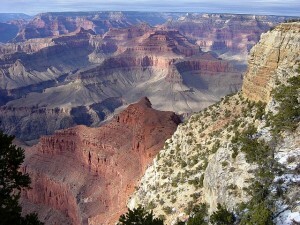 For many, the Grand Canyon epitomizes the ultimate American travel destination. Cleaving a mile deep into the earth and averaging 10 miles across, it compels even the most jaded traveler to pause and draw breath. Snaking along its floor are 277 miles of the Colorado River, which has carved the canyon over the past six million years and exposed rocks up to two billion years old – half the age of the Earth. The two rims of the Grand Canyon offer quite different experiences and, as they lie more than 200 miles apart by road, are rarely visited on the same trip. Most visitors choose the South Rim, which boasts easy access, the bulk of services and the panoramic vistas for which the park is famous. The quieter North Rim has its own charms; at 8200ft elevation (1000ft higher than the South Rim), its cooler temperatures support wildflower meadows and tall, thick stands of aspen and spruce. Some of Arizona’s most beautiful and photogenic landscapes lie in the northeastern corner of the state. Between the fabulous buttes of Monument Valley, the shimmering blue waters of Lake Powell and the fossilized logs of the Petrified Forest National Park are lands locked in ancient history. Inhabited by Native Americans for centuries, this region is largely made up of reservation land belonging to the Navajo and Hopi. Covering almost 2000 sq miles, Phoenix is easily the largest metropolis in the Southwest. At first blush, it can feel like a limitless sprawl, incorporating dozens of bedroom communities, including Scottsdale, Mesa and Tempe. Reveling in more than 300 days of sunshine a year, Phoenix is searing hot in summer – think above 110°F (43°C) – but balmy days prevail in winter. Building on its size, Phoenix has a lot to offer. There are major museums, top-notch professional sports, a cornucopia of excellent restaurants, nonstop nightlife, superlative shopping and – oddly for a desert – world-class golf (where do they get that water?). The city is also a major transportation hub, and is often used as a jumping-off point for further-flung adventures. The park has two separate units, east and west of Tucson. The Saguaro East Visitors Center is 15 miles east of downtown. It has information on day hikes, horseback riding and park camping (free permits must be obtained by noon on the day of your hike). This section of the park boasts about 130 miles of trails, including the Tanque Verde Ridge Trail, which climbs to the summit of Mica Mountain (8666ft). Two miles northwest of the Arizona-Sonora Desert Museum is the Saguaro West Visitors Center. Although night hiking is permitted in this portion of the park, camping is not. The Bajada Loop Drive is an unpaved 6-mile loop that begins 1½ miles west of the visitor center and provides fine views of cactus forests, several picnic spots and access to trailheads. The King Canyon trailhead, just outside the park boundary (almost opposite the Arizona-Sonora Desert Museum), stays open until 10pm and is a great sunset or stargazing hike. A bustling college town where freight trains rumble and old West meets south of the border, Tucson is Arizona’s second-largest city, but it still exudes a small town feel. Distinct neighborhoods and 19th-century buildings give it a rich sense of community and history not found in the more modern and sprawling Phoenix, which boasts a more cosmopolitan (though disputably soulless) energy. Attractive, fun and one of the most culturally invigorating places in the Southwest, Tucson is set in a flat valley surrounded by craggy, oddly shaped mountains. The place is rich in Hispanic heritage (more than 20% of the population is of Mexican or Central American descent), so Spanish slides easily off most tongues and high-quality Mexican restaurants abound. The eclectic shops touting vintage garb, scores of funky restaurants and dive bars don’t let you forget Tucson is a college town at heart, home turf to the 35, 000-strong University of Arizona (U of A). 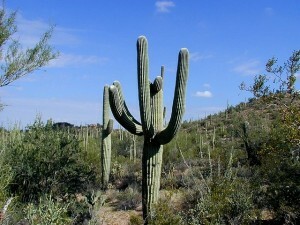 The climate in Arizona is varied due to the fact that the state covers a large area. The lower areas are mostly desert, with hot summers and mild winters. The northern part of the state is at a higher altitude and therefore usually temperatures are cooler – with milder summers and cold winters. Great extremes in temperatures occur between day and night throughout the state, particularly in the desert areas where daytime temperatures over 125°F (52°C) have been recorded. During winter temperatures average 70°F (21°C), dropping to below freezing in the desert valleys, and summertemperatures can vary from 80°F (27°C) to 35-40°F (2-4°C) at night. Snow falls on the mountains, but not in the desert areas, and the mild temperatures in the southern desert attracts many tourists in winter. Monsoons can occur during thesummer months between July and September throughout the state.